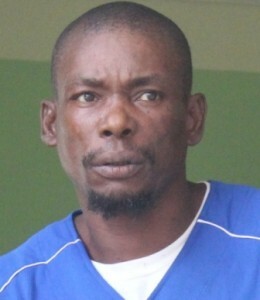 A man, who was allegedly shot by police following reports that he was damaging electrical wires and pipe lines at A&R compound, was today arraigned on a single charge of Damage to Property. Robert Flores was escorted to court after being discharged from the hospital. He pleaded not guilty, saying he was shot twice on his feet by the cops. It was noted, however, that Flores owed the court for traffic offenses, but he produced a receipt showing that the debt had been cleared. With that old bill taken care of, Magistrate Deborah Rogers offered Flores bail in the sum of eight hundred dollars which he was unable to meet and he was taken into custody. In a report, A&R Manager, Earleth Lino, claims that on Monday when she reported to work she received information from the police that electrical wires and a pipe line had been damaged. It is not clear how Flores was shot since he had already been taken to the hospital for treatment to his injuries when Lino arrived at work.